I hope this is not too far off topic, but I wonder if anyone has experiences to share regarding the culinary qualities of pigeons shot around New England dairy farms. I'm flying back to Nashville after my first visit to my newly purchased house in Vermont's Northeast Kingdom, where I'll be retiring this June. While up there I reconnected with a buddy from high school who's built a successful organic dairy and beef operation an hour east of me--milking 300+ Holsteins and slaughtering a fair number of culls. As we were saying our goodbyes, he mentioned in passing that he has a real problem with feral pigeons eating the grain he feeds his cows. Spaniel Gilley and I will have time on our hands and shells to burn, and practice wouldn't hurt either of us. I've shot feral rock doves in wheat country in eastern Washington, and they were as delicious as any doves or quail--crops full of whole wheat berries. My friend runs a clean dairy and feeds hormone-free food to his cows. I'm hoping that's what the birds are drawn to and what they eat. On the other hand, I see regular references to "winged rats" haunting dairy yards and feedlots fit to be dumped in the nearest fence row for the crows and coyotes. There a turkey flock living near a dairy farm close to my house that no one hunts because they reportedly eat (and taste like) cow poop! Has anyone examined the crops of pigeons shot around dairy farms or compared their eating qualities with grain-field pigeons or other doves? They will be no different, turkeys either. You'll be good to go and have fun. I have a dairy farmer buddy who likes the them thinned out regularly. A few guns posted out side 1 end of the barn , he and a few hands come thru banging and rattling things to chase them out and the fun begins. Its constant shooting for 10- 15 min before they get smart and quit trying to get back to the barn. It's a literal blast ! !..we then start breasting and getting them cleaned up for the grill. Do them up just like doves. Marinate in whatever u like with slice of jalapeno and onion ..wrap in bacon ...grab some beers and call it a party !!! 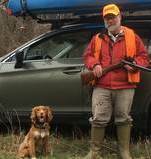 No recipe but requesting some pictures of that handsome spaniel. I am envious as pigeon is high up atop some gastronomic lists. Young pigeon before they are fledged are called squab. I call them delectable! Well, I love to shoot feral pigeons on a farm or dairy. Great fun. One time, the owners wife cooked some up, making “Pigeon McNuggets”. Everyone who ate any of it got a two day bout of the squirts. I ain’t eating any of them again. Thanks for all the replies! I'll probably take my chances after opening a few crops and checking the meat for worms or other signs of parasites. Sorry about the squirts, Kemo--sounds very unpleasant! I'm reminded of a friend in college who, as a biology project, trapped a pigeon and analyzed it for parasites. Found a large number of such, both internal and external, including some that weren't known to exist in the area. I'll pass on eating them. Shoot them around dairy barns with .22 RF subsonic HPs. Much quieter than a shotgun. I've eaten the wild pigeons in South America and they were very good. Tougher than dove though. Extremely sporty shooting in crop fields over decoys down there. I look at em as free range and antibiotic free . I guess u all would cringe at some fried groundhog too. .....lightweights!! I have mentioned several time how much I like pigeon. I butcher my surplus homers every year, and I also have meat birds. I had some for lunch yesterday, sear them in a super hot pan on both sides, remove from pan and sauté some peppers in the same pan. Then make a citrus glaze in a sauce pan and return the pigeon to the pan and glaze them, and make some coconut rice. I like to spoon a little glaze on top. The meat is a pretty delicate meat it can be over powered easily. I love shooting pigeons in late August when they start feeding in cut grain fields. I like these pigeon decoys.